So, I made these plastic shrink bracelet "beads" (I'm calling them "beads", only because I can't figure out what else to call them). 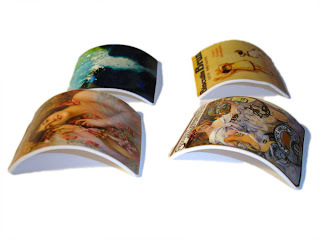 You can see from the side view that I made them to curve around a wrist. I have had them for a couple months and could never really figure out what I was going to do with them. The couple things I had thought of just didn't work. 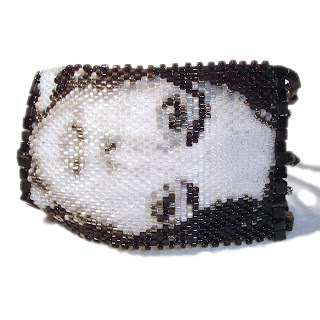 This bracelet is a take off of my other Famous Faces Photo Ribbon bracelets. 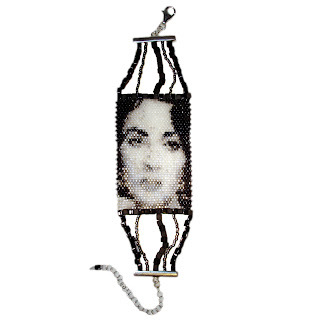 I made this Elizabeth Taylor bracelet so it will fit many different size wrist. It's a 6-1/4 bracelet and has a 2-1/2 Extension. 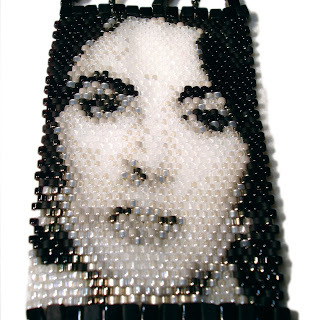 I used a brick stitch with Delica Seed beads and japanese cube beads in shades of black, white and silvers. It has a sterling silver adjustable clasp. Every Famous Faces Bracelet comes with a Certificate of Authenticity and will be packages in a beautiful pink gift box. 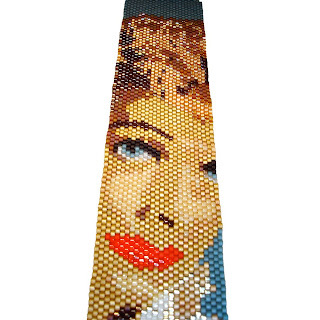 NEW ~ I Love Lucy!! I Love Lucy in color! 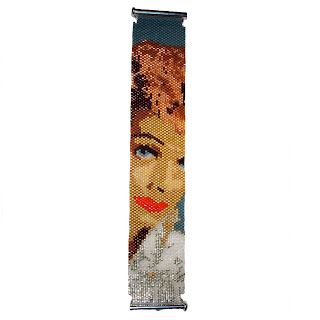 I thought it would be fun to make a bracelet of Lucille Ball in color because of her red hair, hot red lips and beautiful blue eyes. 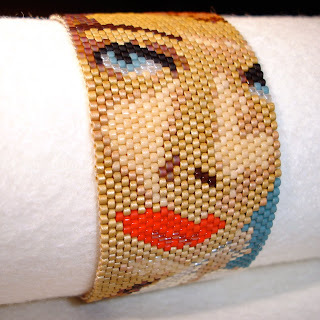 This bracelets measures 1-5/16" wide and is 7" in length. Colors include skin tones shades of orange, slate blue, bright red, white and sliver. 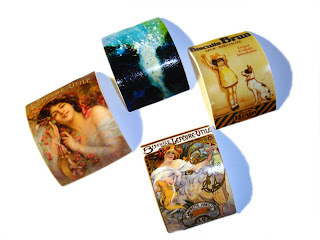 Certificates of Authenticity with each of my Photo Ribbon bracelet. 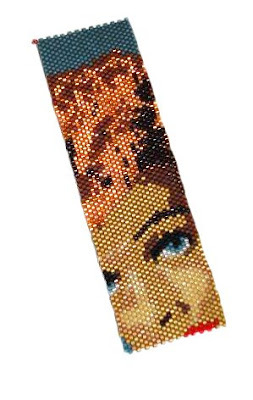 This is a new bracelet I'm working on, Lucille Ball in Color. I thought with her red hair it would look really amazing and I think so far it does. What do you think? Etsy BeadWeavers May Challange ~ GO VOTE!!! and vote for your favorite piece! After you go to her shop, stop by Cozy's Blog! You won't be disappointed! !